It is said that it enters others' dreams to search for its lost love. 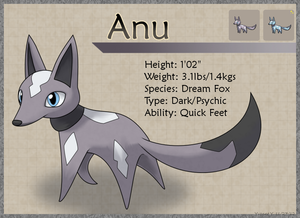 Anu, the Dream Fox tuxemon, is a Metal-type monster. princess-phoenix has released Project Freemon under a Creative Commons Attribution-ShareAlike 3.0 Unported licence for us. Design and sprites by princess-phoenix. Face sprites tweaked by Sanglorian. Back sprite by Sanglorian. This page was last modified on 31 March 2019, at 09:16.